Toronto – May 1, 2014 – A year ago, 1,135 workers were killed and thousands more injured in the Rana Plaza disaster in Bangladesh. In the wake of that tragedy, more than 150 apparel retailers, including Loblaw, committed to The Accord on Fire and Building Safety in Bangladesh. Their signing of the accord is legally binding, not voluntary, and established a groundbreaking agreement to improve factory safety and working conditions. The companies are committed for at least five years, and must comply with safety recommendations issued by independent safety agencies. The push for the accord came from global trade unions, including UFCW Canada, which was recently part of a fact-finding delegation to Bangladesh. The evidence from Bangladesh is that the Accord has started to have an impact. A number of factories have been shut down, and other have been ordered to make safety repairs after independent inspections under the Accord found these facilities to be deficient. But while the Accord is working, a number of companies continue to avoid joining such as Walmart, Target, Gap Inc, Canadian Tire, and Hudson's Bay. They and other companies have set up their own voluntary, self-regulating body, which essentially means they are not bound by any independent agency to live up to enforcing building repairs and safety in Bangladesh. The recognition of safety rights should not be voluntary. The Accord on Fire and Building Safety in Bangladesh recognizes that. It is the law that its signatories must abide by when contracting with garment factories in Bangladesh. 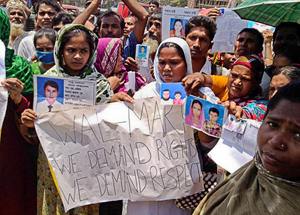 With one year past, it is long overdue for Walmart and other companies to sign the Accord and its legally binding commitment to improve safety conditions for Bangladesh workers.